Wow. This was Fine's best book yet! 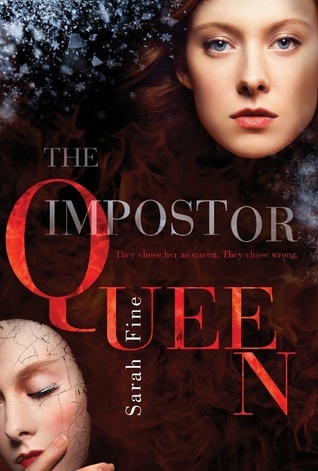 The Impostor Queen was compelling, inventive, and featured an amazing cast of characters. All fantasy lovers like me won't be able to resist this tale of a girl who didn't turn out to be the queen she though she was. So, let me quickly summarize this: Elli has been raised as a Saadella to become the Valtia of the Kupari. However, when she fails to inherit the powers of fire and ice from the previous Valtia, she is forced to run from her pampered life. 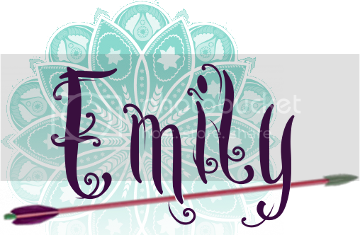 Elli ends up living with a group of rebels and criminals. And there she learns she is not so powerless after all. A prophecy gives her a role in perhaps saving the Kupari from both the dangerous raiders, the Solturi, and from surprising corruption and evil within their own walls. I admired Elli for her love for her people, her Valtia, and her Saadella. I also loved how hard she worked and grew through the book. And I can't not mention the romance! Elli is bi, and has a crush on a girl in the beginning. I loved Fine's diversity! However, the main ship in this book is between Oskar and Elli. I loved these two together sooooo much. I can't wait for more of them. Overall, The Impostor Queen was a major win. I was surprised how quickly I got sucked into the pages. 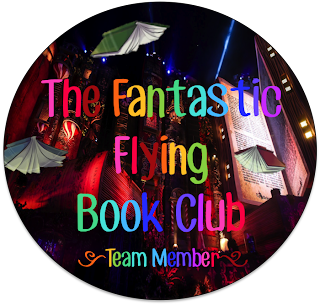 The twists and turns in this new world of magic and strife are guaranteed to keep you on the edge of your seat. After finishing this, I was so pumped for The Cursed Queen! Ansa has always been a fighter. As a child, she fought the invaders who murdered her parents and snatched her as a raid prize. She fought for her place next to Thyra, the daughter of the Krigere Chieftain. She fought for her status as a warrior in her tribe: blood and victory are her way of life. But the day the Krigere cross the great lake and threaten the witch queen of the Kupari, everything changes. I really loved The Cursed Queen. This story is fierce, dark, action-packed, and offers a new, unexpected perspective. However, I am forewarning you that we have a new cast of characters. No Elli. No Oskar. Now we have Ansa, Thyra, and others. Be prepared for the sister story to the Impostor Queen; It's around the same timeline in a different place. And it reveals the true queen of the Kupari! Ansa is in the Solturi tribe, although they call themselves the Krigere. Ansa is ruthless, scary, and flawed. She's sometimes even unlikable. And that's what made her a real and intriguing character. After a battle with the Kupari "Witch Queen", Ansa is certain she has been cursed with witchcraft. She suddenly has powers over fire and ice (If you've read the Impostor Queen you'll know what this means). Ansa has to come to terms with recognizing the significance of her newfound magic. I love Sarah Fine's openness for diversity and lgbtq characters. I also love how she doesn't make a big deal of these things. The characters love who they love, and that's that. Ansa and Thyra are our main couple. They have a lot of chemistry but boy do they have a lot of difficulties! They have trust problems, rank problems, and they disagree on a lot of moral principles. Thyra, the Solturi leader, was a very interesting character. In fact, in some ways, she was more likable than Ansa. She is deadly, but, unlike her tribespeople, Thyra doesn't have a taste for killing, plundering, and raiding. This difference in values causes rifts between the Solturi and Thyra. Our new characters are... well... some are good, some are bad, and a lot are a bit of both. Fine's characters have layers, and faults, and secrets. But let me just say I loved Halina as a character. Others of the cast included Sanders, Jasper, Nisse, and more. 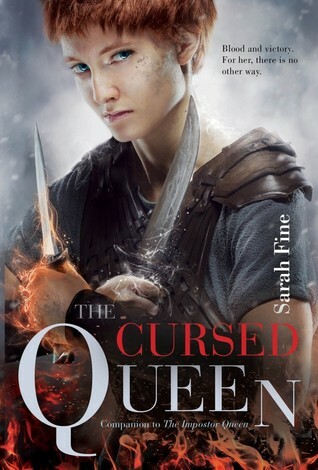 Overall, the Cursed Queen was an interesting, surprising, and twisty read. Fine's decision to give us a key character from an "enemy" tribe was both brave and ingenious. I can't wait to see how the fates of Elli and Ansa entwine in the third book. I'm so excited! Note: I read this immediately after the Impostor Queen, and I think reading these back-to-back is a good idea because, while the characters are new, the stories obviously go hand in hand. The reader probably should try to remember the significance of the Solturi, the Kupari, the Valtia, Sig, Keiko, and more. *I received this book for free from the publisher. Thank you Simon and Schuster! Hope you enjoyed my review of this wonderful new series! What are your thoughts?